One of my favourite treats from the many boulangeries around is les chouquettes. Little airy puffs topped with pearl sugar, it is incredibly easy to munch down a packet of them within minutes and then feel a twinge of guilt for overindulging and/or not sharing. They can be bought on per piece basis (€0.15-0.20 each) or by weight (€2-3 per 100g). I bake them myself from time to time at home, but given my (bad) habit of baking-by-guestimation, it can be a bit of a hit-or-miss exercise. Oops. When it works though, they are pure delights to behold and taste. The list of ingredients for the basic choux couldn’t be simpler – flour, butter, eggs, water and sugar – staples in pretty much any pantry for anyone who cooks/bakes regularly. 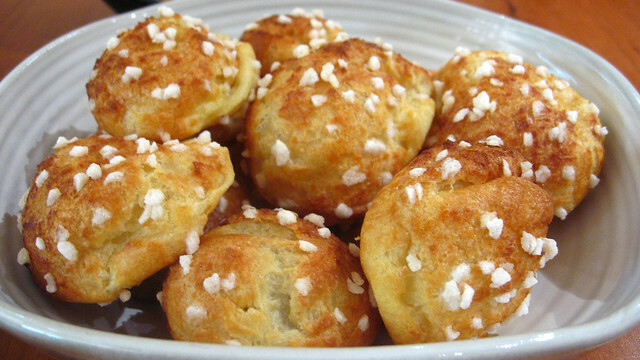 In the case of chouquettes, of course one should not forget the pearl sugar to sprinkle over. In Paris, it can be stocked from G Detou. The basic choux is good not only for making chouquettes, but also baked and transformed into profiteroles (chouquette minus pearl sugar but with custard filling and usually chocolate sauce over), éclairs (elongated profiteroles if you ask me), croque-en-bouche (assembled profiteroles with caramelised sugar coating to give that extra crunch) and St-Honoré (a marriage of choux, crackling caramel and whipped cream). For anyone who likes all things fried, basic choux can also be fried into beignets and churros (oh churros with chocolate sauce haunts my dream). 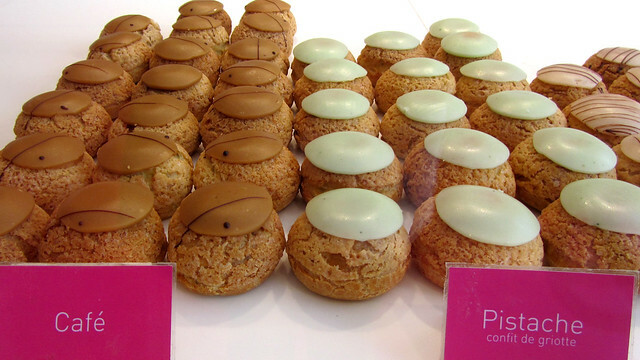 Last year, Popelini, a shop dedicated to cream-filled choux, opened up in (haute) Marais, selling petite-sized goodies that comes in a variety of flavours. Posh profiteroles, if I must simplify it. Instead of typical custard filling and chocolate sauce topping, you’ll find choux with classic and exotic flavours alike, from chocolate to vanilla to raspberry rose to Bailey’s. These little creamy bites don’t come cheap at €1.85 a pop when bought singly, and the flavour of the day has a price tag of €2.95 each. Typical box size is for a selection of 6 popelinis at €11, and unfortunately flavour of the day doesn’t normally fit in the box – too tall with the piped cream topping? – so they are to be bought separately. If all of the above sounds too sweet or creamy, basic choux can also be used to make savoury treats by adding grated cheese – often Gruyère, Comté, or Emmental – and voilà, you now have gougères to serve/eat. I have noticed gougères to be more and more à la mode, served in restaurants as appetiser bites. To pretty them up, they may be topped with poppy seeds and the likes. Gougères can be made not only in bitesizes, but also of individual serving portion (not unlike bread buns), into a ring (great for sharing at dinner table), and I have read about gougères with fillings inside but having never personally tried to make or eat them, I don’t know much to dish about it. I have observed Chloé in action though, and while the resulting goodies didn’t look the perfect boules like above, they still packed a good punch taste-wise. Recently, she even made some that are gluten-free and they were delicious too. I need to get the recipes to test out some time. 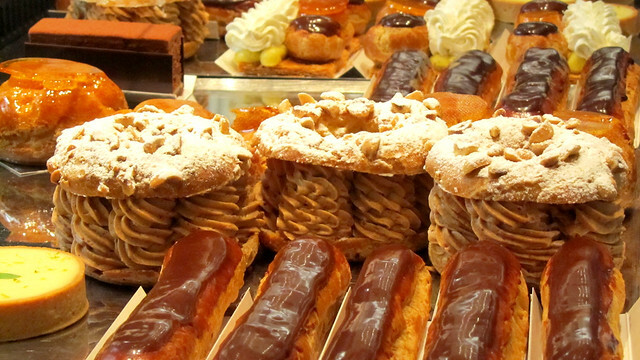 My favorite pastries are all choux based — éclairs, the réligeuse, Paris-Brest, chouquettes… I could go on and on. But my very favorite choux treat is the gougère. I can’t wait to make these with a poppy seed sprinkle. Thanks for the tip! choux-based goodies are the best! – aren’t profiteroles rather fled with ice cream rather than custard? 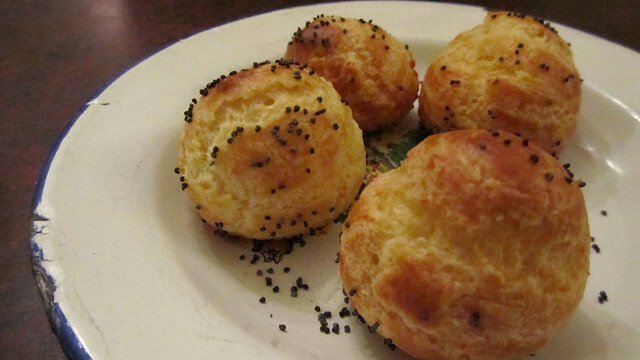 – gougère recipe: it’s really the same as chouquettes, apart from the cheese/sugar items. so you already have that ;) and the gluten-free version is there: http://delicesdhelene.canalblog.com/archives/2007/06/01/5105013.html not quite the same thing but certainly eatable!